Avoiding sugar is almost impossible, but we can offset its power by understanding what it does and then eating less of it. Sugar is metabolized into fat. With regular exercise, we can further interrupt the sugar-to-fat ratio and burn some of it off. 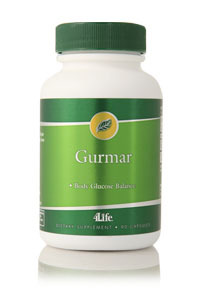 Gurmar is an herb that slows the absorption of sugar into the blood stream and slows the conversion of sugar into fat. Gurmar fits well into a weight management program because it complements exercise and dietary reform by curbing sugar appetite. This product can be added to any weight management program. 4Life Transfer Factor GluCoach, Gurmar and Catalyst Plus have helped promote normal sugar levels within my body and healthy metabolic and endocrine systems. With the addition of a healthy diet, I’ve been able to lose 30 pounds as well! "I take Fat Complexer, Gurmar, EnzyRite and Tea4Life. I have never felt better and have lots of energy." "After taking Gurmar, Catalyst Formula and Cardio Formula for six weeks I had a check-up with my doctor. My blood pressure, blood sugar and weight are at healthy levels. It is the best report I have had in 8 years. My doctor is still not a believer, but he said that if I think the products are helping I should keep taking the them. If in three months my health continues to improve, he might give the products some credit. We will show him!"